Designers offered a variety of styles at the end of the 1930s, including wide-skirted dresses, as alternatives to the clinging bias-cut gowns. In August 1939 Vogue described the scope of the Paris collection: 'Molyneux's hoop-flared day skirts walk beside Lanvin's modern peg-topped hobble skirts; Balenciaga's wide Velázquez paniers dance past Paquin's tightly wrapped mummy skirts'. This creation by Edward Molyneux has its double-tiered, full skirt held out by four bone hoops. 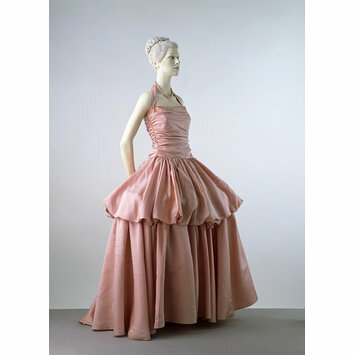 The dress was worn by Stella, Lady Ednam, and forms part of the Cecil Beaton Collection. This Collection was brought together by the society photographer Sir Cecil Beaton (1904-1980). With great energy and determination Beaton contacted the well-dressed elite of Europe and North America to help create this lasting monument to the art of dress. The Collection was exhibited in 1971, accompanied by a catalogue that detailed its enormous range. 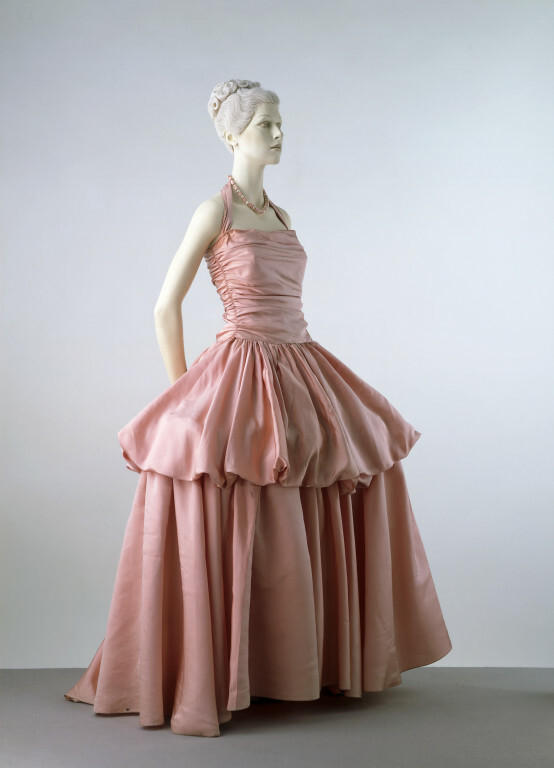 Evening dress of pink ribbed silk. The bodice (with a slightly dropped waistline) is softly ruched into the side seams - the left side fastens with a pink metal zip. It is supported by a wide halter strap which is attached to the straight, low neckline. The full skirt is double-tiered, and held out by four bone hoops. Evening dress of ribbed silk, designed by Molyneux, Paris, 1939.